How hundreds of thousands of people have been given a chance to shape policy. Time travel back one year ago to land in the heart of Seoul, South Korea. It is alight with the glow of hundreds of thousands of candles and pulsing with the call for change. Starting in late 2016, around a million Korean citizens gathered peacefully in Gwanghwamun Square every Saturday to protest the regime of then-President Park Geun-hye. Fast forward to May 2017, and the months of mass demonstration gave way to a new administration. Park was impeached and President Moon Jae-in was elected on promises to champion greater communication and collaboration with the Korean people. Staying true to his word and embracing the open government tenet of putting citizens first, President Moon launched a 100-day government program called the “Gwanghwamoon 1st Street” (“Gwanghwamoon” combines the name of the historic Gwanghwamun Square with President Moon’s own name). Determined to establish an open dialogue with his citizens, President Moon created the People’s Transition Office (PTO) to lead the initiative, and I was to serve as the PTO’s general manager. We set up a temporary office just off Gwanghwamun Square, and installed local branches in nearly every municipality to collect policy proposals from citizens themselves. Once again, Koreans flocked to Gwanghwamun Square, this time to help shape the national agenda rather than oppose it. 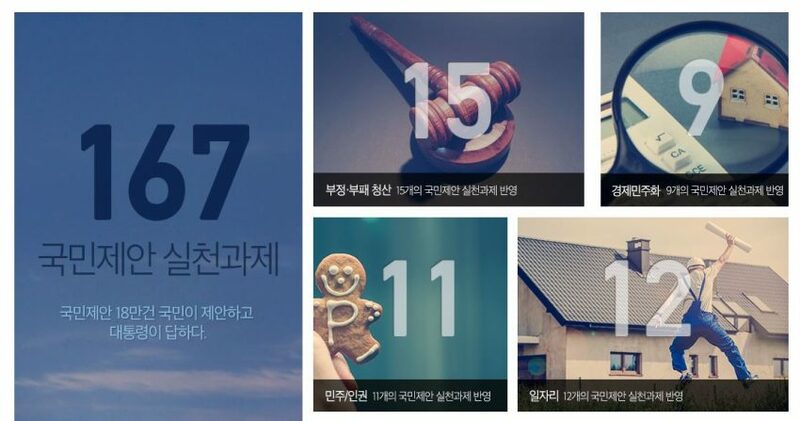 In just 49 days, 180,705 suggestions for the new government were submitted on the Gwanghwamoon 1st Street website or at one of the temporary PTO offices. Of these, just over 1,700 of the very best proposals were integrated into government policies. One proposal came from a resident of Wirae, an area composed of three adjacent cities—Songpa, Hanam, and Seongnam. He described how citizens of Wirae depended either on small, newly built fire stations, libraries, and police stations in each of the cities or existing facilities outside Wirae. During the “Talk with the President” program of the Gwanghwamoon 1st Street initiative, the Wirae resident explained that neither option was ideal as the small facilities provided low-quality services while the facilities outside of Wirae were hard to access. He suggested combining the facilities of each municipality to create one large fire station, public library, and police station at the center of Wirae, which could be accessed easily and quickly by all Wirae residents. On November 2, 2017, the Ministry of Interior and Safety drew out an agreement to carry this idea forward. Another suggestion came from a woman whose father was killed while working as a barge crane operator. A tower on barge ships, the barge crane transports heavy freights between the dock and commercial vessels. The woman’s father was killed when the barge crane collapsed into the sea under the weight of several overweight freights. She discovered that while the law requires vessels to pass a safety inspection, barge ships are exempted because they do not have an engine and operate only in the dock area. After hearing this woman’s story via Gwanghwamoon 1st Street, the Ministry of Oceans and Fisheries promised to change the law to include barges “with crane” in the list of ships required to pass a safety inspection. Alongside the open call for policy suggestions, the PTO conducted a series of public debates on controversial and previously undiscussed topics, including THAAD deployment and an agreement made with Japan on rehabilitating “comfort women,” or women and girls forced into sexual slavery during World War II. For most of the debates, social activists took to the stage while government officials sat among the audience, listening and commenting. And every Saturday at 5pm, hundreds of people gathered for the “People’s MIC,” during which participants, both young and old, made short speeches about changes they hoped to see from the new government. Finally, citizens and celebrities alike donated 579 books to “The President’s Bookshelf.” All contributions are now suggested reading material in President Moon’s office. In a country still reeling from the corruption scandals of its former leader, South Korea’s Gwanghwamoon 1st Street initiative serves as a testament to the power of open and accountable government. Many of the visitors to the PTO office at Gwanghwamun Square were previously perceived as ‘trouble makers’ and were often ignored by government offices. Their initial engagement with our office was also full of anger. However, when they saw that our staff was sincerely trying to listen to their concerns, attitudes began to change. Some of them even cried, saying this is the first place where the government listened to them. Some of them even cried. At the upcoming Asia Pacific Leaders Forum (APLF) on Open Government, leaders from government, civil society, and business will share more examples of inspiring reforms like this one. I am not alone in having high expectations for the APLF. Deputy Minister Iljae Kim of the Ministry of Interior and Safety who will be heading the delegation to Indonesia, said he hopes the exchange of best practices at the Asia Pacific Leaders Forum will provide meaningful insight into the government reform efforts of Korea and other nations in the Asia Pacific region. Sungyeol Shin is Director of the Public Participation Policy Division in the Ministry of the Interior and Safety, Republic of Korea.